The project included construction of a 250,000 gallon elevated storage tank which replaced an existing hydropneumatic pump station. Also, approximately 3,200 L.F. of 12-inch water line was installed to upgrade the system loop along Highway 79 Bypass. The new raised standpipes enabled the Noack WSC facilities in Williamson County, Texas to supply adequate water to all customers during peak demand periods at pressures of 35 psi or greater. The water system improvements contribute to having sufficient facility capacities for an estimated future 500 total connections projected in approximately 2020 and beyond. 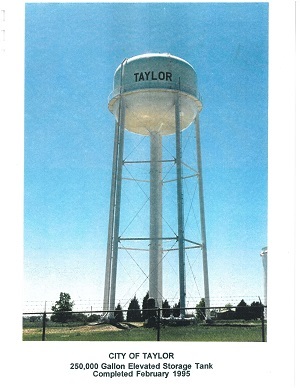 Water supply sources included Noack WSC wells and a contract with the City of Taylor. Services Provided: Preliminary Engineering, Environmental Assessment, Final Design Phase, Bid Phase, and Construction Phase.